Go-Getter. Innovator. Risk-Taker. Leader. Show off your Girl Scout G.I.R.L. pride! Be inspired--and inspiring! 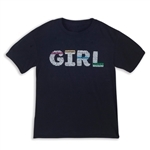 With inspiring GIRL-themed words on front and back screenprinted with "Powered by Girl Scouts." Crew neck. Traditional fit. Cotton knit. Imported. Available in youth sizes XS - XL. Also available in Adult sizes: click here! 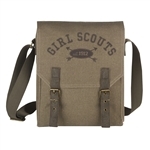 Utilitarian function meets cool fashion in this khaki messenger bag with Girl Scouts est. 1912 imprint. Adjustable web strap with buckle hardware. Front flap with buckle closures. 13" x 11". Cotton canvas with metal hardware. Imported. A mini accessory that lets you take your G.I.R.L. power to the max! Sophisticated, black leatherette with goldtone hardware. Multi-color G.I.R.L. motif in bright glitter adds some glitz to the spacious zipper compartment at front. Top handle for quick toting. Adjustable straps. Partial side zipper closure. Fully lined in polyester with interior nylon zip pocket. Imported.d. Put some sparkle in your step! Waist pack has iridescent, rainbow-colored, holographic sparkle design. Front zipper closure. 28" black strap at back adjusts to 44". “Girl Scouts” and trefoil outline imprint on bottom. Interior pocket. Lightweight and compact. Can be worn as crossbody bag. 9" x 5½" x 1". Polyester. Imported. Show off your troop pride with this great Troop Rules tee! These great new shirts are available in both youth and adult sizes.